The fermentation of the natural sugars (and starches) in grains and grapes yields beer and wine, and this has remained essentially unchanged for almost 10,000 years. Distilling these products yields pure ethanol. 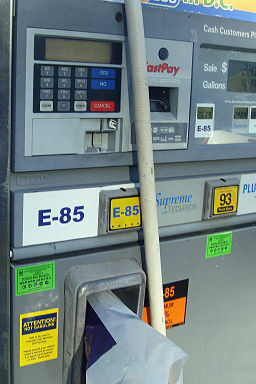 Recently, there's been much ado about Ethanol subsidies in Congress. Corn producers are very keen on keeping these subsidies intact, of course. However, utilizing a good portion of our food grain for fuel production probably isn't a long term solution as it will serve to increase food prices. In their discussion, the authors state that they suspect that they have identified just one of a host of enzymes which make lignin digestion possible. In the future, scientists may be able to engineer a bacteria which overexpresses these genes and that might lead to industrial scale production of cellulosic ethanol.